Brave Spirits Theatre pairs the well-­loved comedy A Midsummer Night’s Dream with the rarely produced The Two Noble Kinsmen to interrogate to what lengths we will go for love and what happens to those who get left behind. 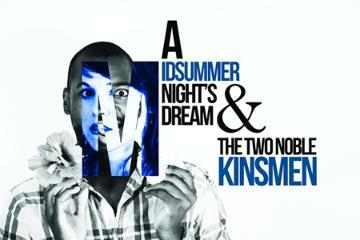 Though Midsummer was written early in Shakespeare’s career and Kinsmen was a much later collaboration with Fletcher, both stories are set in the realm of Theseus, who, days before his marriage to Hippolyta, must decide how to manage two young men rivaling for the attentions of one woman. A Midsummer Night’s Dream is a perennial audience favorite, despite Samuel Pepys’s infamous dismissal of the work as “the most insipid ridiculous play ever.” Indeed, audiences have found much to rejoice at within the ridiculous frivolity that is A Midsummer Night’s Dream. With fairies, magical potions, runaways in the forest, and mythological characters, A Midsummer Night’s Dream adds up to a evening of sheer entertainment. The Two Noble Kinsmen is likely to be new to most audience members. Based on a tale from Chaucer, Kinsmen follows the changing fortunes of two best friends, Arcite and Palamon, who fall in love with Hippolyta’s sister, Emilia. With a more melancholic tone than Dream, the twists of Kinsmen’s plot will keep the audience guessing.